Boris Kovač, soprano sax, alto sax, bass clarinet; Stevan Kovač Tickmayer, piano, prepared piano, keyboards; Miloš Matić, double bass; Lav Kovač, drums. Boris Kovač and Tickmayer have been together for some 30 years and have spent their time investigating possible links and associations between apparent principles of composition and improvisation and the differences. 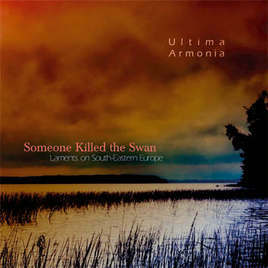 Ultima Armonia – The Last Harmony – research a further extension of that work, each musician being equivalent and liberated, yet entering into a form of responsive contract with the traditional music of their region as well as sieving through the extensive history of modern musical development in Europe. That perennial question as to how this music may be categorised is raised again – ethnic free jazz? I suppose that it shouldn't really be seen as jazz, but so much of it reminds me precisely of that musical mode, along with the folk music from the vast area between the Carpathians and the Balkans. The music expresses lamentation throughout its entire progress. It is especially well and completely articulated in Track 7, The Rite, which starts lightly but becomes distressed and gloomy, doleful and dark, then mournful, pitiable and eventually wretched, as any of us might if we found the swan had been killed. Despite the woe, the music is wonderfully magnificent and always disciplined without being at all regimented. I'll settle for ethnic free jazz.